I recommend using the Sims 3 to help find your style, especially if you’ve had the same look for the last few years. You can use this program to create a digital doppelganger and then experiment, risk-free, with different hairstyles, clothing styles, makeup and color palettes. The game lets you fine-tune your look to a minute level of detail: you can change everything from the length of your gloves to the depth of your nostrils. However, the game has its drawbacks. It is extremely addictive. It goes on forever. And your clothes always fit perfectly, whatever your body type. You don’t get a realistic sense of where real clothes might pinch or hang loose. 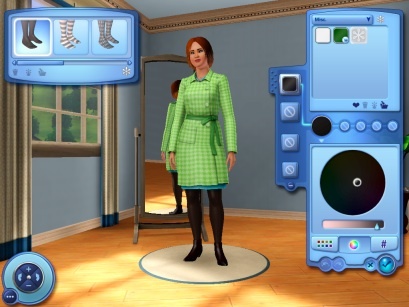 The Sims 3 is not a substitute for trying clothes on––it merely helps you experiment with your style. In this tutorial, I’ll cover how you can use the Sims 3 to evaluate your own lifestyle, and what you might need to change in order to "fit" your new style. If you’re just starting out, you’ll see the “create a sim” button in your start-up menu. If you already have a game running, you’ll have to go to “edit town” and click on the “create a sim” button from there. A loading screen will appear. After a few minutes, you should see the “create a sim” panel, along with a random, nameless sim. You can tweak and tweak until this sim look exactly like you. Or, you can take a shortcut by using a pre-made sim, accessed by clicking on the "pre-made sims" button. Now you’re ready to set your sim’s gender, skin tone, and body size. You can also name your sim now. You set the gender by clicking on the male or female button. It’s that simple. Setting the skin tone is a two-part process. First, chose which shade best fits your skin tone. Then, slide the slider until you get the skin tone you want. You might not be able to get a perfect match, especially if your skin tone is actually three or more different tones blended together, or if you’re mixed race. In that case, the game might be of limited use to you––until someone comes out with a new modification or some skin-tone related custom content. To change your body type, adjust the two sliders for fat and muscle distribution. Here, again, you might not be able to get the best match. If you’re overweight, you might gain weight in different places from your sim. You might have broad shoulders, or narrow hips. But try to find a body shape which best matches your figure. This is also difficult psychologically. If you haven’t been working out, you probably don’t have much muscle mass. If you’re overweight, you have to face it. 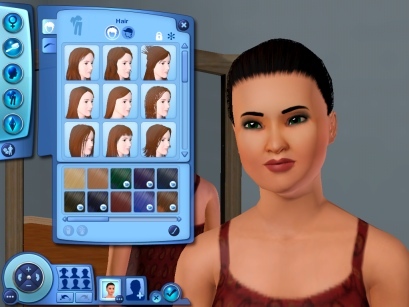 Your sim’s facial features can be adjusted to a minute level of detail. You can change the angle of their inner eye corner, the tilt of their chin, even their nostril depth. The interface is simple; it’s finding the right “look” that’s hard. This is why I advised you to find a sim whose facial features resemble yours; it makes your job much easier. The "face" button is third from the top. 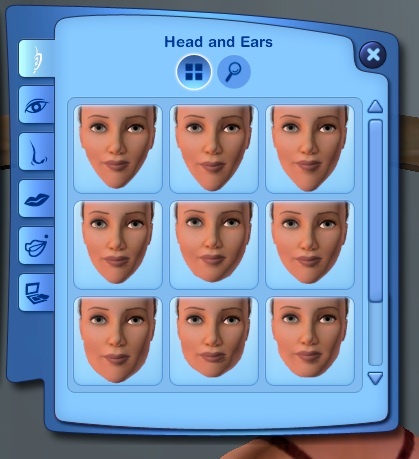 When you click on it, another menu will open, allowing you to adjust your sim's face shape, nose shape, eye shape, and mouth shape. The magnifying glass button allows you to go into more detail for any of the adjustments. Pressing those buttons will open another level of detail. Adjusting the nose, eye shape, and so on all follow this model of selecting a template, then making adjustments. 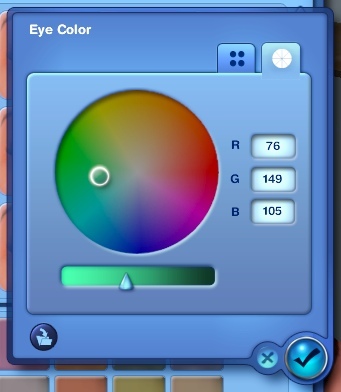 When you select eye color, you can either select one of the given eye colors, or you can create your own by clicking on the paintbrush "create a style" button. The slider on the bottom adjusts the brightness of the color wheel. Your iris probably has more than one color; here, again, the game oversimplifies reality. Try to find a color which most closely matches your dominant eye color. If you have two different colored eyes...write to EA Games and ask them to add it in the next expansion pack. Or post in the Sims 3 forums; someone’s bound to come up with that modification at some point in time. Now you’ve made your face as life-like as you want it to be. It’s time to do your hair. Hair is the second button from the top. The game allows you to choose a hairstyle and a hair color. The hairstyle options are somewhat limited; the hair color options are limitless. You can select a hairstyle with or without accessories (such as hairclips, hats, ribbons, and so on). If you’d like different hairstyles for different outfits (e.g. swimwear, formalwear), be sure to unlock the lock at the top right of the menu. 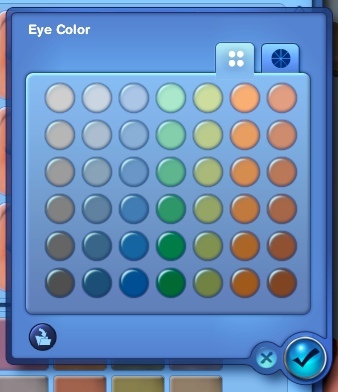 You can change hair color the same way you select eye color. For hair color, you can adjust the main hair color, highlights, tips and roots. If you want to change your sim's hairstyle for different outfits, be sure to unlock the hairstyle by clicking on the small lock in the top right corner. You can also adjust eyebrow shape and color, by clicking on the eyebrow tab. When you check “match root hair color,” your eyebrows will match the root color of your sim’s hair. However, your real eyebrows might not match your root color; try to experiment with other colors. If you’re a man, there’s a third tab for facial hair, which you can adjust in the same way. Your sim can’t walk around naked––put some clothes on them! The game lets you choose outfits for everyday use, formalwear, sleepwear, workout clothing and swimwear. The main utility in this step is seeing how certain outfits fit (or don’t fit) together. If you don’t like trying on clothes in a dressing room, you might be too focused on the awful experience (or your physical imperfections) to notice if an outfit works or not. If you want to change the color or pattern of any apparel item, from an earring to a suit, simply click on it. You’ll be taken to the "create a style" module. Like the facial adjustments, the “create a style” module takes some practice and finesse to get used to. There are many patterns to choose from, and you can change the color scheme of any of them, using a preselected color, a color wheel, or a hex. My advice is the same as for facial adjustments: experiment and play around. Don’t worry about getting it “wrong.” Once you’ve bought the game, the cost of creating a horrendous outfit is the same as creating a beautiful one––nothing! Note: If you unlocked the hairstyle in step 3, you can change your sim’s hairstyle for each outfit. You can’t change makeup, though. Last but not least. 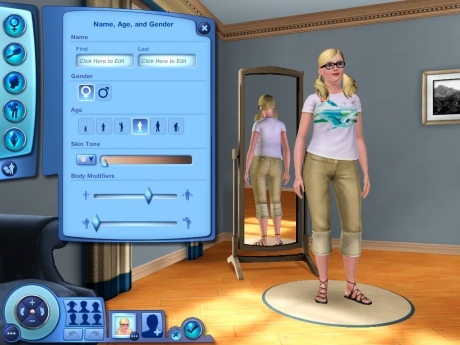 You can add between one and five personality traits for every adult sim. Toddlers, kids and teens have two, three and four traits, respectively. Adult sims also have to pick something to aspire to in life. Their aspirations depend on what personality traits you select. Of course, you have more than five personality traits. You might even have contradictory ones (which the game doesn’t allow). But this can give you more insight into your style. What do you want people to assume your personality is? If you want to be a doctor, can you really do that if you’re a couch-potato and a hopeless romantic? What if you hate being in the hospital, which is where doctors work? If you’re a loner, does it make sense to be a “Heartbreaker” (be the girl/boyfriend of 20 different sims)? Real life involves looking yourself squarely in the face, zits and all...otherwise, how can you know what’s really important? If you’d like to be more ambitious, ask yourself what would stimulate that ambition. If you’d like to be more flirty, ask yourself what’s stopping you. If you don’t like kids, how will that affect your job, your partner, even your friends? And ask yourself, how does your style reflect your personality? How does it reflect your ambitions? If you want to project a professional demeanor, why do you wear jeans and a t-shirt? You will notice that most Sims can’t dress themselves worth a lick. Baby blue blazers with black pinstripe pants, lime green trenchcoats with gold sandals, pumps and socks––and it gets worse! Unlike real life, these sims don’t pay a price for their lack of style. Or do they?––I’ve noticed that computer-controlled sims tend to stay low on the career ladder, and enter careers don’t gel with their personalities or ambitions. Perhaps they’re like the many people who live life on “autopilot,” who go with the flow even if it takes them in the wrong direction. Or perhaps I’m reading too far into it...nah...reading into things too much is so out of character. Buy The Sims 3 at Amazon.com .